← Happy Blogiversary, and to Many More! While I wasn't able to find any in my neighborhood, I setup a demo AP for some WEP cracking at home. For those of you that didn't know, I recently picked up a new alfa card, so it was time to give it a test drive. 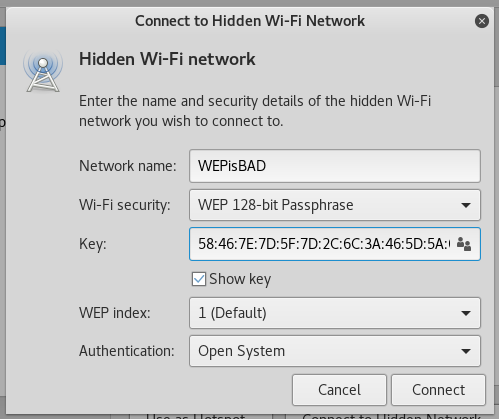 First, I setup a 2nd SSID on my AP that would support WEP, and generated a random 128-bit key. Once I configured the AP, I ran airodump to find the new network. 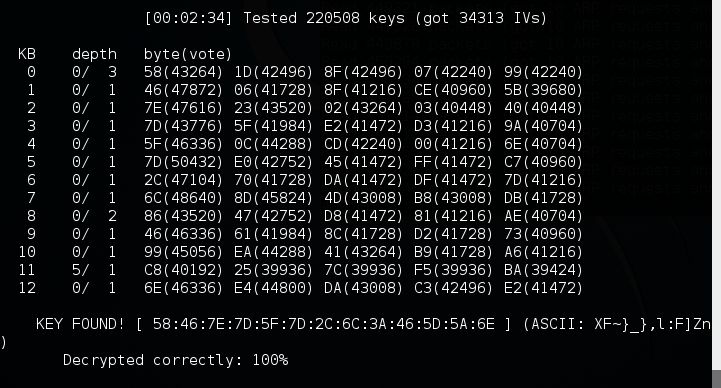 Note that the encrypt flag will filter out my results, and only show me WEP networks. After I found the new SSID, I restarted my monitoring interface on channel 1. Once the monitoring interface was back up, it was time to test packet injection. With packet injecting possible (at a 100% rate), I started airodump again to begin capturing IVs. The next step was to perform a fake authentication with the AP. The reason for this is that the AP will not accept packets from a MAC address that it does not already recognize. Since I do not know the WEP key yet, aireplay can fake an authentication for me. Once the fake authentication was complete, I was able to start generating traffic. In this case, I used aireplay in ARP replay mode. This will allow aireplay to listen for ARP request packets, and then inject them back into the network. This will allow us to obtain a lot of IVs in a short period. After awhile (around 5000 data packets), I tried to crack the key. As you can see, this did not work (mostly because I set a random 128-bit key to start). That said, aircrack will retry the attack every 5000 IVs until it is able to crack the key. Starting PTW attack with 6735 ivs. Once I had just over 34,000 IVs, aircrack was able to get the WEP key! To verify the key was correct, I attempted to authenticate using the networking UI. After a few seconds, I connected, and iwconfig showed my access! While WEP cracking is a little less relevant nowadays, it was still a fun exercise to try out my new toy. For more information about this attack, and many more, I recommend the aircrack wiki.